Scientists at the Large Hadron Collider say a signal that suggested they might have seen "hints" of the long-sought Higgs boson particle has weakened. New results to be presented this week at a conference in India all but eliminate the mid-range where the Higgs - if it exists - might be found. Physicists will now search for the boson at lower and higher energy ranges. It is much more difficult to detect new particles in these ranges, however. Nonetheless, LHC researchers still believe they will either have found the Higgs by the end of next year or confirmed that it does not exist in the form proposed by the current theory of subatomic particles and their interactions, called the Standard Model. "These are exciting times for particle physics," said Sergio Bertolucci, the research director at the European Organization for Nuclear Research (Cern), which runs the LHC. "Discoveries are almost assured within the next 12 months. If the Higgs exists, the LHC experiments will soon find it. If it does not, its absence will point the way to new physics." The Higgs particle was postulated by physicists in 1964 to explain how other sub-atomic particles have mass. It remains the only major particle in the Standard Model yet to be observed, and its discovery or elimination is one of the LHC's chief objectives. Last month, scientists reported at the Europhysics meeting in Grenoble, France, that the collisions were throwing up some intriguing results. The data presented at the meeting showed what physicists described as "excess events" across the search area - or mass region - where the Higgs has been predicted to be found. The most significant of these was a surplus of unusual particle events at a mass of 140-145 gigaelectronvolts (GeV). Since the results were presented, the amount of data collected by the two detectors being used to find the Higgs has more than doubled, according to Fabiola Gianotti, who speaks for the Atlas Collaboration, one of the teams searching for the Higgs. "Thanks to the superb performance of the LHC, we have recorded a huge amount of new data over the last month," she said. "This has allowed us to make very good progress in our understanding of the Standard Model and in the search for the Higgs boson and new physics." Guido Tonelli, speaking for the other group at the LHC involved in the search, CMS, described the LHC's performance as "fantastic". "Whatever the final verdict on the Higgs, we're now living in very exciting times for all involved in the quest for new physics," he commented. An updated assessment, to be discussed at the Lepton Photon Conference in Mumbai , shows the excess events appear to be melting away, and along with them much premature excitement. It is often the case in particle physics that one will see an excess building up when the data sample is small, but as one moves on the excess will be either reinforced or diminished; and what seems to be happening now is that the excess is diminishing. The physicists are used to this - but under the glare of media scrutiny in what may turn out to be the biggest science story of the century so far, every twist and turn of this thrilling project is seized upon and pored over by reporters. According to James Gilles, the director of communication for Cern, it is now that the real work starts. "In some mass areas, the Higgs is much easier to see than in others so in some mass areas it was always going to be easier to find it or exclude it quite quickly," he told BBC News. "And now what we're being left with is the harder part; the regions where it's harder for us to see and harder to pick out the signal from the background." The ranges left after these results suggest that the Higgs is either quite a light particle, below about 145 GeV, or a heavy one, above 466 GeV. A couple of islands in the middle, around 250 GeV, have not been fully excluded yet. According to Cern, Atlas and CMS have excluded the existence of a Higgs over most of the mass region 145 to 466 GeV with 95% certainty. For the researchers at the LHC, this is now the endgame in their search for the Higgs. But it is a search that could still take many months. 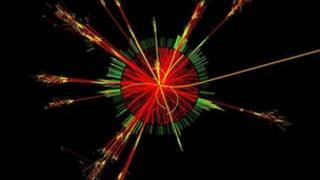 Is the Large Hadron Collider closing in on Higgs particle?